Hi Adam – I wanted to ask if you would like to have a home race in Ireland? Would it be it nicer to race in your home country or city? Thanks for answering. AC: It would be great.They would have to have a street race in Dublin or Belfast. It would be very exciting. Either would be a perfect city to host a race as they are lively and would be great spots for everyone to go to. It would be awesome to have an A1GP race over there; Ireland doesn’t have a race at the moment so our home race is Brands Hatch. However, it doesn’t matter if it is your home race or not you still have to perform wherever you go. When do you use your PowerBoost button most – in defending a position or in overtaking? Does it really make that big a difference? Cheers. AC: You can use it for both actually, the trick is not to waste a PowerBoost press for no reason. It is so easy to use a PowerBoost and not overtake anybody. You use it when you know you have a run on a guy and he has made a little bit of a mistake or something like that. If you get into a little bit of trouble it can help you get down a straight. If you don’t need the PowerBoost to overtake someone then I don’t use it. I’d rather end the race with a couple left. It does actually make a difference, about 30 horsepower, which equates to about 500rpm in each gear and you do feel it. AC: Not a whole lot actually. A1 Team Ireland is based in Northampton in England. Because the cars aren’t there and there is no testing in A1GP the guys get to go home and can do their own bits and pieces. There are obviously some things we need to do between races, maybe some bodywork repairs or whatever, but really it is just going through routine stuff you need to do between races. We will meet up as a team and go to the offices and sit down and have a chat a week before we go to the race. If they’d offered you a drive, would you have raced for A1 Team Great Britain, rather than A1 Team Ireland, this season? AC: No, I couldn’t do that! I suppose I was unlucky or lucky to be in the position where I would be eligible to drive for both. But you know it is really good to race for Ireland, as a country, and as a racing team. My job is to get the car up the front and beat Great Britain. Adam, you have raced both extensively, so what are the differences is between an A1GP car and a GP2 car? AC: You can’t really compare the two. A GP2 car is actually easier to drive because it has a bit more grip and an A1GP car is hard to drive. It is very physical and the steering is heavier. A1GP races in Malaysia and Taupo, where the grip levels have been high, are really hard work. You get more track time in setting up an A1GP car, and there is a big variety in the kind of tracks A1GP visits compared with [similar tracks in] GP2. But it all adds to a really great championship  it is hard and really close. If you look at the qualifying and lap times this season it has been really, really close. I’ve been very impressed with A1GP. Hi Adam, what did you race in before you got to A1GP? AC: I started in Formula Renault Campus when I was 16, then I moved up to Formula Ford. Then I had a few seasons in Formula Three, firstly in the Scholarship class in older machinery, and then in the full Championship class. I have also raced in GP2 and won five races. I have also clocked up 4000km of Formula 1 testing with Honda. But the option to race in A1GP came up again for this season and everybody was seeming to enjoy the championship so much and it was getting stronger and stronger. Since I have joined A1GP, I have to admit that those things were true and it has been very enjoyable. But very hard too! Adam – are there any young Irish drivers coming up through the ranks that are any good? Who do you rate who could race for Ireland in a few years? AC: Well, Niall Quinn, our rookie driver is definitely one of them. Ireland is not that big a country and there are not many racing drivers. Niall is very good, kept the car in one piece and has done exactly what he’s been told to do. For example, Durban is not exactly an easy place to come to with little experience of a high-powered single-seater but he did very well. He does a good job with everything and helps us set up the car. How has your pace been this year? Did you expect to have days when you were doing really well and have days when you were near the back of the field? AC: We had a hard time to explain really. We were quick in Brno when I started but at some circuits we’ve gone to we have really struggled. It was quite frustrating because we don’t really know why. We have gone from somewhere like Taupo where we were strong, to Australia two weeks later where it just didn’t work. We were just wondering what went wrong. We then would have had the pace in Durban because in the race my pace was as quick as the leaders. Unfortunately, the fuel pump went in the last half hour of practice when we started to get on top of things. And then it went again in qualifying and we had to start last. After all that trying, did you think the win in Mexico would ever come? How has the team progressed since? AC: It is funny, these things. Our pace was always there and nothing really has changed, everyone is just a bit more relaxed. The potential was there, so we knew we are good enough to win. It took a bit longer than we hoped for but we got there in the end. Now Ireland can hope to be a major player next season. We just try so hard and everyone in the team wants to win so much. We’re the hardest working team in the paddock. Everyone is in early and late out most days. Are you hoping to race for A1 Team Ireland next season and, if so, how much are you looking forward to racing the new car, Powered by Ferrari? AC: The new car sounds really good and great for the championship in terms of lifting its status. The current cars cause some great racing but for the championship to take a step forward this new car will be very good. If it turns out like the guys have described it then it is going to be a really good car. I want to do next season  they’ll have to fire me first! It is has been a fantastic season. Even though it has been hard work and a tough time it has been very enjoyable. I have really enjoyed A1GP as a series, everyone is nice and relaxed and gets on well but as soon as the visor come down it’s a different story. I’ll fight everyone till the end on the circuit, that’s just the way it goes. To find out more about Adam Carroll visit his official site here. You can also visit the Team Ireland site. 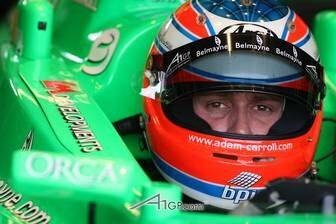 Categorised under A1GP, tagged under A1 Team Ireland, A1GP, Adam Carroll.